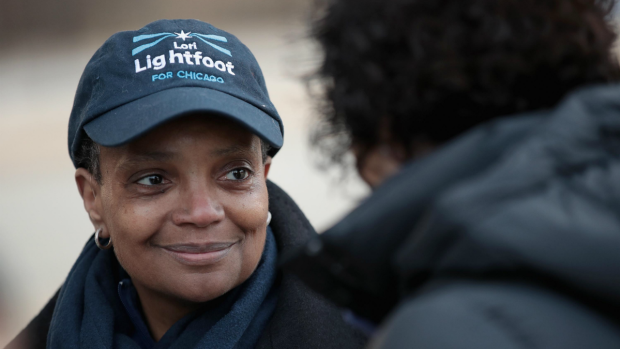 Chicago Mayor-elect Lori Lightfoot will enter office in May facing quite a few challenges. She ran as a political outsider, painting herself as the candidate to reform City Hall and Chicago's so-called "machine." After sweeping all 50 wards in a resounding victory, her victory speech gave a glimpse at what areas she plans to focus on moving forward. "Together, we can and will make Chicago a place where your zip code doesn't determine your destiny," Lightfoot told a crowd of supporters Tuesday night. "That means we can and we will make our streets - all of our streets - safe again," she continued. "We can and we will give every single one of our children - all of our children - access to the high-quality education they deserve. We can and we will give our neighborhoods - all of our neighborhoods - the same time and attention that we give the downtown." A former federal prosecutor, Lightfoot is the former president of the Chicago Police Board and was appointed to chair the Police Accountability Task Force in 2016, in the wake of the fatal shooting of Laquan McDonald. She touted her experience in police reform throughout the campaign and touched on it in her speech Tuesday night. "We can and we will build trust between our people and our brave police officers so that the communities and police trust each other, not fear each other," Lightfoot said. She also spoke on the city's violence, pointing to the family members of several people fatally shot across the city. "I've seen the tears of mothers who have lost their children to the city's plague of senseless gun violence," she said. "Our duty as a city, as leaders, as neighbors, as people is to stand with these mothers and children and put an end to this gun violence once and for all." Lightfoot will be sworn in in May, then nearly immediately have to address the city's violence that typically peaks in summer months. She has said she plans to meet with Supt. Eddie Johnson to discuss the department's plans for the summer but that she would hold off on making a decision on whether to replace him until after the summer is over. Lightfoot has previously said that she wants to "focus on the root causes of violence," and work with federal partners to stop the flow of guns into the city. She also said she wants to focus on CPD's relatively low homicide clearance rate by improving evidence collection, having beat officers build relationships within their communities, and providing support for victims and families, among other proposals. Another issue looming as soon as she takes office - Lightfoot will head to the bargaining table when the Chicago teachers' contract is up in June. 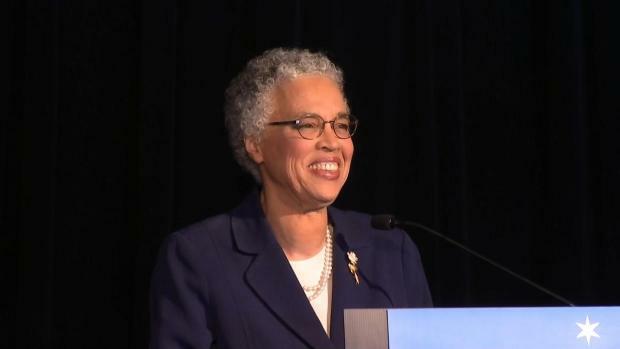 Her opponent Toni Preckwinkle was backed by the Chicago Teachers Union, but Lightfoot gave a nod to the educators who supported her instead, without mentioning the upcoming negotiations. "I particularly want to thank all those teachers out there who have supported me," she said. When it comes to education policy, Lightfoot has previously proposed the adoption of an "equity policy statement" like those in place at other districts around the country, which would require changing of systems and practices that perpetuate inequities in opportunity. To implement this, she has said that she would convene a district-wide equity council, as well as conduct an analysis of programs, schools and budgets to improve educational outcomes. Lightfoot also highlighted her aim to help grow small businesses in Chicago in her speech Tuesday night, vowing to cut through red tape. "I've met small business owners who want to start or grow their businesses but they say it takes two years just to get a permit, or a license or a sign," she said. "These business owners are part of the economic engine of our city. They serve their neighborhoods and create jobs. They just want a city government that's a help and not a hindrance. So we're going to help our small businesses and not stand in their way," Lightfoot continued. She also focused on supporting Chicago's immigrant population, in a sort of continuation of the stances outgoing Mayor Rahm Emanuel has taken, even criticizing President Donald Trump without using his name. "These people are scared. They're scared of the climate of hate and fear, fanned and promoted by a culture in Washington, D.C., and from the White House in the capital of our own country. They're our neighbors and they're scared by a knock on the door in the middle of the night followed by agents coming in to haul them away," Lightfoot said. Emanuel has publicly battled with Trump on Chicago's status as a so-called "sanctuary city" - the term used for jurisdictions that do not comply with federal requests to detain undocumented immigrants who have been arrested on charges unrelated to their immigration status and turn them over to US Immigration and Customs Enforcement for possible deportation. The Trump Administration's Department of Justice has vowed to cut federal funding to "sanctuary cities," a battle waged in the legal system. "For 150 years, Chicago has welcomed generations of immigrants from all over the world and all over America," Lightfoot said Tuesday night. "They built this city and made it what it is today. Now it is our solemn duty as a city, as people, as neighbors, to stand up for our immigrant families, to protect them and stand against hate." One area Lightfoot did not directly address was the city's tenuous financial situation. The city's operating budget is at least half a billion dollars in the red, and the four city-obligated pension funds combined are currently funded at 27 percent - well below what's considered healthy at 80 percent. She's previously said she plans to look into structural reforms like combining each of the pension plans' administrative functions to cut down on costs, plus advocating in Springfield for "progressive revenue sources." But Chicago's beleaguered finances were seemingly not at the forefront of her mind in celebrating her victory.